cadet. , he went off to the United States to attend flight school at Williams AFB, AZ where he graduated in 1987. He was commissioned as a Second Lieutenant pilot in 1986 and He subsequently attended Lead In Fighter Training (LIFT) at Holloman AFB, NM flying the AT-38.. After commissioning after graduating LIFT, he came back to Kuwait to join Squadron 9 to fly the Skyhawk A-4 in 1988. He accumulated over 1000 hours in the Skyhawk A-4. Between 1988-1993, General Abdullah attended both safety courses and obtained his pilot training instructor qualification via courses in the United States. In the day of the invasion he flew and attack the Iraqi invaited forces in 2nd Aug 1990, In 1991, after the invasion of Kuwait, he fought as part of Operation Desert Storm in the liberation of Kuwait. In 1993, General Abdullah transitioned to the F-18 Hornet, receiving his training at Lamoure NAS, VFA-125 Squadron. Upon completing the transition course, he returned to Kuwait and joined Squadron 61 where he served as the safety officer and in 1997 went to US to have his Instructor pilot course at Randolph AFB in TX and from 1997-2001 flying the F-18. 2003, General Abdullah was selected to attend the Kuwait Staff College course followed by a tour as a staff officer. United States. 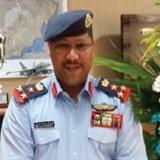 Upon graduation in 2012, he returned to serve as the Deputy Commander Al Jaber Air Base until 2013. From 2013-2015, he served as the J5 for Joint Operations/Planning at the Kuwait Ministry of Defense. Since early 2015 until recently, he served as the Kuwait Air Force, A3, Director of Operations and now he is the KAF deputy Commander 2016/7.